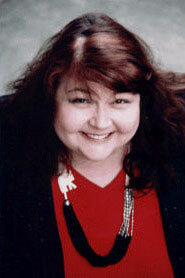 Lynne Murray is the author of the award-winning Josephine Fuller, sleuth of size, mystery series. Her humorous essays, interviews and reviews have appeared in magazines and newspapers. She lives in San Francisco. "I knew I wanted to write a novel featuring a fat heroine with a take-no-prisoners attitude when the book hit the wall. I threw the novel I was reading when I reached a page where the book's heroine sneers at a fat character. It was one fat joke too many. I had to do something. "I wasn't sure how to create a fat fictional character who refused to be ignored or disrespected. It turned out that what I had to do was to become a self-accepting woman of size in the process of writing about one. "Larger Than Death, the first book in the mystery series featuring Josephine Fuller, a sleuth of size who doesn't apologize, won the National Association to Advance Fat Acceptance (NAAFA) Distinguished Achievement Award. "In Bride of the Living Dead (Pearlsong Press, June 2010), I set out to write a romantic comedy about love and marriage. I conjured up a rebellious, plus-sized heroine whose idea of dressing up is wearing a monster movie T-shirt and jeans to go to the movies. Yet Bride of the Living Dead finds our heroine trapped into a formal wedding with her anorexic, perfectionist older sister planning the whole thing. "My humorous short pieces have appeared in magazines and newspapers. Many of these articles, including the most fun one of all — an interview of Darlene Cates, star of What's Eating Gilbert Grape? — are available on my website at www.lmurray.com. "I share an apartment with a small group of extremely mellow cats, who are all either rescued or formerly feral." & one other Pearlsong Press paperback!